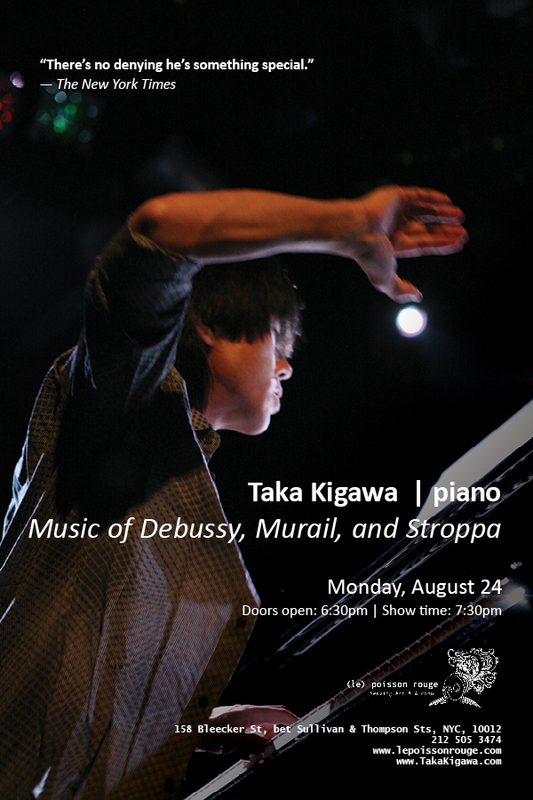 Critically acclaimed concert pianist Taka Kigawa performs a solo recital at (le) Poisson Rouge, a venue that has brought him praise from both audiences and critics. Kigawa will perform the music of Claude Debussy, Tristan Murail,and Marco Stroppa with live electronics by Rafael Valle. A native of Nagano, Japan, Kigawa received a Bachelor of Arts from Shinshu University and a Master of Arts from Tokyo Gakugei (Liberal Arts) University, graduating with honors in Piano Performance. He has performed extensively as a recitalist and soloist in New York, with appearances in Weill Recital Hall at Carnegie Hall and Alice Tully Hall; Washington, D.C.; Boston; Cleveland; Paris; Milan; and Barcelona. His New York City recital in 2010 was chosen as one of the best concerts of the year by The New York Times, and his New York City recital in August 2011 was picked as one of the most notable concerts in the 2011-2012 season by Musical America. For more information and to purchase tickets, please visit (le) Poisson Rouge’s website. Previous Previous post: Waku Waku +NYC Japanese Anime Con in Brooklyn NYC!